Selected Bibliography: "My Kinsman, Major Molineux"
Nathaniel Hawthorne Society. This site is essential for learning about the current state of Hawthorne studies. Hawthorne in Salem. This site at North Shore Community College includes biographical and architectural information as well as pictures of sites associated with Hawthorne, including the Custom House. Hawthorne Home Page. Eric Eldred's excellent Hawthorne site at Eldritch Press contains all of Hawthorne's works, notes on the writings, annotated editions,and lots of other information. This is an essential site for those working on Hawthorne. The Scarlet Letter: The Classic Text. This site at the University of Wisconsin provides background information and critical essays. Hawthorne in the Columbia Encyclopedia.This site at bartleby.com has essays by 20th-century critics such as Carl Van Doren. Hawthorne and Melville. This page at the Melville site has a great deal of information about the friendship between these two men. Biographical Sketch of Hawthorne from the Heath Anthology site. Review of a new biography, Hawthorne in Concord. Nathaniel Hawthorne Bicentennial Exhibition at the Phillips Library of the Peabody Essex museum includes an interactive feature on Hawthorne and his sister's handwritten 1820 newspaper, The Spectator. News item (includes picture of Sophia Hawthorne): "Hawthornes to be reunited"
Nathaniel Hawthorne Collection at Bowdoin College. 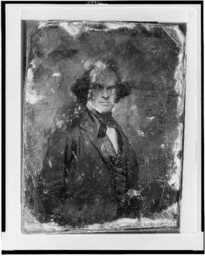 Daguerreotype of Hawthorne circa 1850-55 courtesy of the Library of Congress. Complete Works of Nathaniel Hawthorne at Eric Eldred's Eldritch Press Hawthorne site. 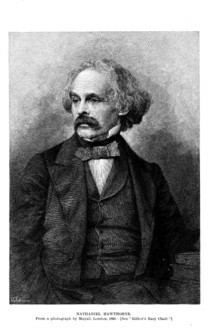 Nathaniel Hawthorne was a kind-hearted man as well as a great novelist. While he was consul at Liverpool a young Yankee walked into his office. The boy had left home to seek his fortune, but evidently hadn't found it yet, although he had crossed the sea in his search. Homesick, friendless, nearly penniless, he wanted a passage home. The clerk said Mr. Hawthorne could not be seen, and intimated that the boy was not American, but was trying to steal a passage. The boy stuck to his point, and the clerk at last went to the little room and said to Mr. Hawthorne: "Here's a boy who insists upon seeing you. He says he is an American, but I know he isn't." Hawthorne came out of the room and looked keenly at the eager, ruddy face of the boy. "You want a passage to America?" "And you say you're an American?" "From what part of America?" "Skim-milk Folsom, sir," said the boy, with glistening eye, as the old familiar by-word brought up the dear old scenes of home. "It's all right," said Hawthorne to the clerk; "give him a passage."